Floating free above Earth and carrying out an experiment in space has long been the preserve of orbiting travelers, but at taxpayer's expense. Now the Zero Gravity Corporation (Zero-G) has initiated what could be tagged as "fee-floating" -- whereby private individuals can book a plane seat and experience the feeling of weightlessness. But there is another aim of Zero-G's aerial roller coaster: To help cultivate the legions of passengers needed to establish a hale and hearty suborbital and orbital space travel and research marketplace. A specially modified Boeing 727-200 aircraft, dubbed "G-Force One", is making the rounds -- no, make that the ups and downs -- around the nation to introduce this privately financed form of in-the-air acrobatics. The aircraft's parabolic flight patterns temporarily counteract Earth's gravity, thereby creating prolonged weightlessness and giving those inside the chance to experience what it feels like to float free in space. Central to Zero-G's business plan is to make the excitement and adventure of space accessible to the public in a safe, fun and cost-effective fashion. That being said, it's a long weightless leap from the words uttered in 1962 by John Glenn, America's first orbital space trekker, buttoned up tight in his single-seat capsule: "Zero G and I feel fine." In many ways, taking to the air to snag precious seconds of space-like conditions harkens back to the 1920s. That was a time when barnstorming pilots offered the public joy rides for a price. Over eight decades ago, providing a ticket-in-hand individual their first taste of flight was just one element of a "flying circus" that included wing walking by daredevil aerialists, along with loop-the-loop and other crowd pleasing feats by goggled and gutsy aviators. Those early, formative years of flying were not subject to federal regulation, with barnstorming able to flourish during the post World War I era. Today, offering pay-for-parabolic flights meant going through a series of regulatory hoops. Zero-G's launch sponsor, Diet Rite, is working with the company to showcase the concept across the nation -- from the company's home port of Fort Lauderdale, Florida to New York, Los Angeles, Dallas, Atlanta, and Detroit, Diamandis said. During the early part of an eight-year process to get the idea off the ground, literally, Diamandis said the issue that proved daunting was the fact that nothing in the Federal Aviation Regulations -- called FARs -- anticipated something like parabolic flight. Luckily, Diamandis told SPACE.com , in the past two years a number of "true visionaries" within various levels of the Federal Aviation Administration (FAA) provided the guidance needed for his company to develop a safe, and entertaining program under Part-121 of the FARs - the same regulations that govern American and United Airlines. 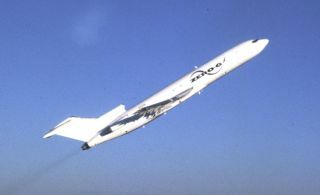 In order to get the needed approvals, Diamandis explained that a detailed engineering review of every major element of the 727 was done, demonstrating its safety in performing Zero-G services. The major modification enabling the Boeing 727 to conduct "weightless flight" involved an upgrade to the aircraft's hydraulic system. That change allows for continuous hydraulic pressure during the performance of parabolas. The modification, along with the addition of accelerometers in the cockpit, were tested and approved by the FAA under a Supplemental Type Certificate (STC), the firm's website notes. "We built a 60,000 node Finite Element Model of the aircraft, strain-gauged the aircraft and demonstrated that the stresses were well within normal tolerance of the type-design. We also had to develop an interior which complied with the passenger regulations of the Part-121 FARs," Diamandis said. The company needed to apply for and obtain a few exemptions too. For example, because the parabolic maneuver takes the aircraft to greater than plus or minus 30 degrees in a nose-up or down attitude that is considered an "aerobatic" maneuver and, therefore, everyone on the aircraft is technically required to wear a parachute. "We demonstrated that a parachute is not needed. It adds no additional safety, and we were able to obtain an exemption," Diamandis noted. "The bottom line is we have a fun, safe operation that the entire team is proud to bring to the public." During the FAA certification process, Zero-G conducted more than 1,000 parabolas for flight certification and safety demonstrations. In addition, in partnership with Warner Brothers Studios, the company performed 200 parabolas during six flights to conduct special effects filming for the Matrix 2 and Matrix 3 movies. The Zero Gravity Corporation sees five different markets for their services: adventure travel for the general public; corporate and incentive-class flights; the film and entertainment industry (movies, television programs, and advertising); research and education; and domestic & international government agencies. Zero-G's doors are open to university researchers, scientists trying to perfect their experiment, as well as hardware makers anxious to help see if their widget will work once it gets a taste of the true space environment. There are other ways to get the drop on microgravity -- right here on Earth. Researchers can use drop towers. These are long vertical shafts from which air is evacuated, with experiments dropped into the shaft to experience microgravity conditions. Drop towers and tubes have been used for a variety of experiments such as liquid crystal diffusion and containerless processing of metallic materials. Drop towers, however, typically provide an experimenter from 2.2 to 10 seconds of freefall time, shorter than that gained from parabolic aircraft flights. For example, Tethers Unlimited, Inc. of Lynnwood, Washington, recently chartered a Zero-G flight to test out several technologies in a microgravity environment. manipulate other space objects, said Robert Hoyt, President and chief scientist of Tethers Unlimited. The idea behind the Grapple, Retrieve, And Secure Payload (GRASP) experiment is to capture space debris for disposal and to provide a simple, low-mass means for one spacecraft to dock with another. The development of GRASP has been funded by a seedling contract from the Defense Advanced Research Projects Agency (DARPA). The hope is to perform an on-orbit demonstration on a nanosatellite within 18 months, Hoyt said. Putting research aside, one key market Zero-G desires to capture is an eager to try and fly public. The Zero Gravity Corporation will start its first parabolic flights for private customers on October 9th. Each seat is priced at $2,950 and includes a full day experience with an astronaut plus Zero-G merchandise, lunch, cocktail reception and other items. Flight operations are conducted out of Fort Lauderdale-Hollywood International Airport. A Zero-G flight includes 15 parabolas, divided up into two martian (one-third gravity); three lunar (one-sixth gravity); and ten "zero gravity" hops. The total in-flight portion of the "Zero-G Experience" consists of approximately two hours. The G-Force One accommodates up to 27 individuals and six crewmembers. At present, the youngest person allowed to fly on Zero-G's aircraft is set at 15 years old. This is the age that the FAA allows for a person sitting at the emergency exit row. In the future, the company may consider lowering the minimum age to 12 years old when accompanied by a parent as a parent-child program. On the roster of those already taking part in early Zero-G flights: television personality Penn of the magical twosome, Penn and Teller; rocker Billy Gibbons of ZZ Top; as well as former Apollo 11 moonwalker, Buzz Aldrin. A brand new addition to that list is aviation pioneer and SpaceShipOne Designer, Burt Rutan. He recently enjoyed his first weightless flight, experiencing one Mars, one lunar, and then 27 zero-g parabolas. So too is Doom software creator, John Carmack and his Armadillo Aerospace team of X Prize rocketeers. "When I walked off the airplane, if they had offered to let me turn around and do it again for the same price, I would have taken it in a heartbeat," he said. Another Zero-G graduate is George Whitesides, Executive Director of the National Space Society, a public space advocacy group based in Washington, D.C.
"Once you experience Zero Gravity for the first time in your life, you don't want it to be your last," Whitesides said "Parabolic weightless flight will be the first rung on a ladder that extends to orbit and beyond." Whitesides said that seeing how the media and entertainment industries play with a canvas of zero gravity may be the most interesting thing to watch. "I am sure that weightless reality shows, sports, commercials and music videos are not far away. That, in turn, may be the pop culture boost that gets the new space age truly launched," he observed. The Zero Gravity Corporation was founded by Diamandis, along with former shuttle astronaut, Byron Lichtenberg. "Our goal has always been to help create an entry business for the space tourism market. We believe that almost everyone who desires a chance to fly on an X Prize-class vehicle will want to first experience weightlessness on a parabolic flight so they can focus on enjoying the view," Diamandis explained. "It's also important to demonstrate a successful business model that makes money in the space tourism business...a success that will spur the venture capital markets to invest," he said. Diamandis said the hope is to create a mainstream business. "My personal goal is to do for space what Scuba diving did for the oceans... give the average person a chance to personally participate." But at a per-person parabolic price tag of roughly $3,000, will the float-for-a-fee concept take hold? The Zero-G initiative is significant in that it brings space tourism to the people of the United States, points out Troy Thrash, Program Manager for the Futron Corporation in Bethesda, Maryland who specializes in space tourism trends. "It has been possible for years for the public to fly on parabolic trajectories and experience the sensation of weightlessness, but participants always had to travel to Russia to do so. Higher costs, inconvenience, and perceived risk of those Russian flights will be minimized with the advent of Zero-G flights over American soil," Thrash said. Thrash stated that the small price tag, ease of accessibility -- especially when Zero-G can fly its vehicle from multiple air fields around the United States -- and the "Made in the U.S.A." stamp are going to be a momentous step toward igniting American public interest and participation in space tourism. "I believe the Zero-G flights will officially mark the shift of U.S. public interest and participation in passive space tourism, such as museums and space camps, toward active space tourism, which ultimately includes adventure flights to suborbit, orbit, and beyond," Thrash said. The idea that Zero-G airplane rides may well cultivate future space travelers is shared by Derek Webber, Washington D.C. Director of Spaceport Associates. However, it's too early to tell just how strong that link might be, he said. "This new public Zero-G facility, for instance, will be great for training the new space tourists." Webber said that space business is under transformation, and everything that generates public interest is to be encouraged, such as the Zero-G flights. "Certainly, the price levels for the experience are much more in the realm of possibility for the average space cadet than is the case for a full public space flight today. So it opens up the opportunities for folks who do not have a high net worth, but still want to be personally involved," Webber added. "It is somewhat ironic that just at the time when the public is getting more and more interested in being involved in space, NASA is struggling to get its funding approved by Congress," Webber said. "I do believe, however, that they are beginning to understand the need to be more relevant and responsive to the public." It remains to be seen, Webber continued, whether Zero-G flight participants will be more or less likely to subsequently partake in space tourism when it is affordable to them. "I think there must be a link between those who undertake terrestrial surrogate space experiences, like the Zero-G flights, and the demand for space tourism. But I have not yet seen any reliable quantitative market research that explores this link," Webber concluded.